Is this true? Are actions the only thing that ultimately count in this world? Or is there real power in ideas, and the words that convey them? I think it is very significant that God chose to create the world with words – it seems he was trying to tell us something about how the world should work. Words convey ideas. And history has shown that over time, a powerful idea will have staying power – countries, institutions and movements that have a compelling ideology will surpass and defeat those that do not, even those with greater economic or military power. In ancient times, it was none other than the People of Israel who showed the world the power of an idea. In an entire world dominated by paganism, the People of Israel had a completely different conception of life: monotheism. This idea transformed the world – through Christianity it became one of the pillars of Western civilization, and through Islam it conquered another entire section of the world. Today, over half of the people on earth are monotheists. And with this we also brought other transformative ideas to the world, such as justice, kindness and holiness. In modern times as well, ideas have ultimately conquered actions. Soviet premier Joseph Stalin may have sarcastically asked “How many (military) divisions does the Pope have?” in 1935, but by the time Boris Yeltsin climbed on a tank in 1991, it was clear that an idea that can stir millions is more powerful than the mightiest of armies. It will be at the end of days, the mountain of God’s house will be established above the mountains, and raised above the hills, and all the nations will strebvam unto it. And many nations will go and say “Let us go up to the mountain of God, to the house of the God of Jacob. Let Him teach us His of ways and let us walk in His paths”, for the Torah will go forth from Zion and the word of God from Jerusalem. And He will judge between the nations and decide for many peoples, and they will beat their swords into plowshares and their spears into pruning hooks. Nation shall not lift up sword against nation, and they shall not learn war any more. 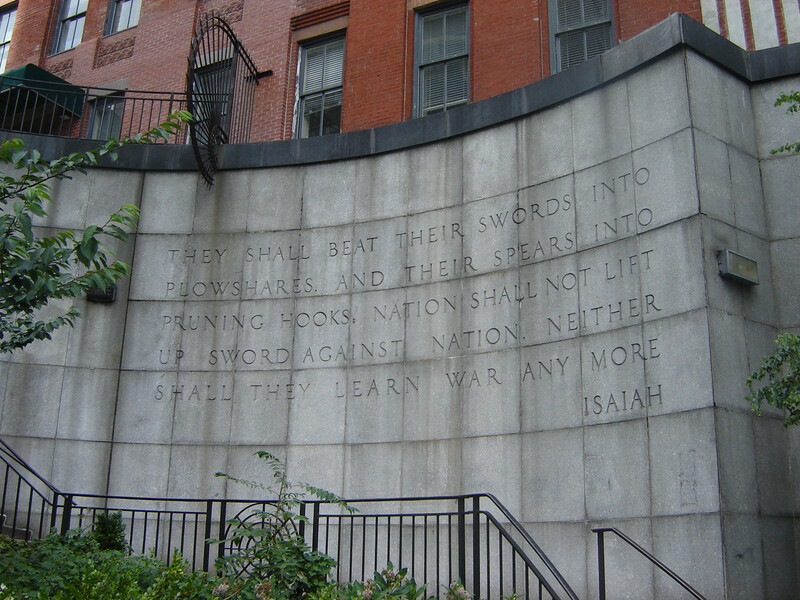 Although the world is still clearly far from the fulfillment of this vision, it is highly significant that these words are engraved on a wall outside of the United Nations headquarters in New York, and commemorated in a sculpture in the United Nations garden. The world was created with words and ideas, and it will be perfected by words and ideas. Making that happen is our job. This entry was posted in Uncategorized on October 14, 2012 by rabbihaber.